24 hours a day, 7 days a week, Veselka is a popular East Village restaurant, turning out a menu that seems to continually grow larger and larger. There is always a lot of activity, in front and behind the counter. I have never sat anywhere except at the bar here, whether alone or with someone. It is a good place to be surrounded by all the confusion, but somehow remains a tranquil area to eat. There is a spot open 99% of the time no matter how crowded the restaurant, so it always draws me there. I think the main flaw of Veselka is for trying too much, but you cannot really fault them for it. Manhattanites love this place, as well they should. It seems "ethnic" to people who never leave the borough, and they can order a burger and fries and not feel guilty about it. As I sat next to the outgoing orders shelf, I noticed that three quarters of the meals were American breakfasts or burgers, with a small smattering of Ukrainian dishes in there for good mix. Those dishes are done well, but not great, maybe a byproduct of concentrating too hard on bringing in the dollars with such standard fare. On a recent visit, seated at the counter, I ordered the bowl of borscht ($4.50, above) and the Ukrainian meatball appetizer ($6.95, below). They both were whizzed out in under 4 minutes, but came fresh and hot. 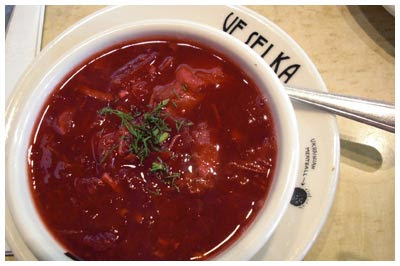 The borscht is not as beet-y as its Polish brother, but is thicker and filled with goodies. It comes either vegetarian or non, and has plenty of good kick. The fist-sized meatball is interesting, and tasty, looking almost like a meal of biscuit and gravy upon arrival. The ground meat is white in color on the inside, but my questions into why this was so got me nowhere. "Beef with spices" and "The recipes here are closely guarded" were as far as I got, but no matter as the dish is satisfying enough. The gravy was the best part, and I will probably ask for extra next time. I have never tried the breakfasts and American dishes, but they look standard enough and I am not really sure the reason to eat it here. An exploration of the Ukrainian specialties always rewards the diner with above average fare, especially the beef stroganoff ($14.75) and stuffed cabbage ($12.95).